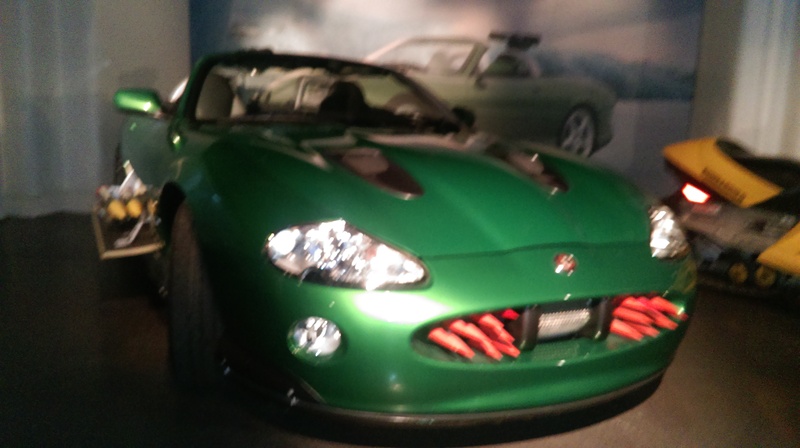 Changing Lanes visits Bond in Motion at the London Film Museum! Bond in Motion is the largest official collection of original James Bond vehicles under one roof and features over 50 original vehicles from the 23 Bond films released to date, including cars, bikes and boats. So when I was in London recently, I thought I would go and have a look. I’m not really a “museum person” but if it’s cars I can just about stretch to it! Bond in Motion turned out to be even better than I thought it would be. The exhibition starts on a mezzanine level with some insights into the creative process of film production with concept art and storyboards from the films. Key scenes are told in hand drawn sketches, there are clapboards from the shoots and diagrams of some of the purpose built machinery used in the films. Then it’s downstairs to the main exhibition hall. Before going downstairs you can take a look at the 1/3 scale model of the helicopter used in Skyfall suspended from the ceiling. Downstairs it’s a dark, dimly lit basement with low ceilings and pillars creating an intimate atmosphere. You can go around the exhibits, 25 in total, at your own pace with an audio guide narrated by Ben Collins that gives more information about each exhibit. I would highly recommend paying a bit extra for the audio guide – unless you are a complete Bond nerd you will appreciate the extra insight into each exhibit! The wall sized video projections showing clips from the film behind each car, along with the music, narration and insight on the audio guide, make each exhibit come alive. It’s Bond nirvana. All the iconic Bond cars are here including the yellow and black Rolls-Royce Phantom III from Goldfinger, the Mustang Mach 1 from Diamonds Are Forever, and the Aston Martin Vanquish and Jaguar XKR that battle it out on the ice in Die Another Day. Bond’s 90’s affair with BMW is represented by the BMW Z3 from Goldeneye, BMW 7 Series from Tomorrow Never Dies and BMW Z8 from The World Is Not Enough. 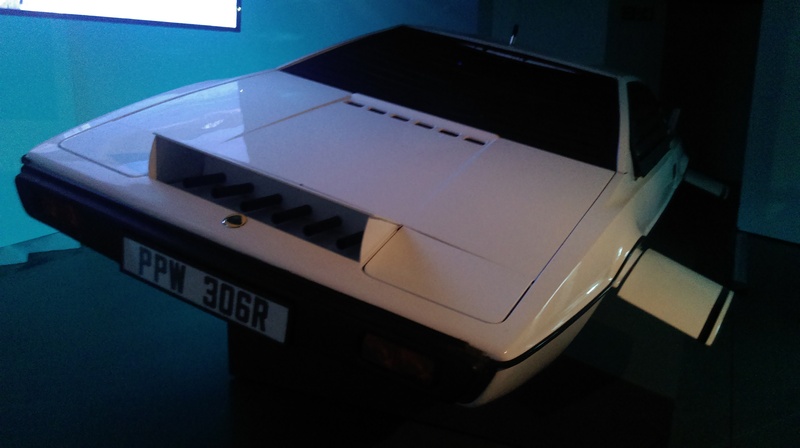 One of the most interesting exhibits is the Lotus Esprit from The Spy Who Loved Me displayed under moving blue light that gives the illusion of being underwater. And of course the most iconic of all Bond’s cars is here – the Aston Martin DB5 lives on despite an apparent apocalyptic end in Skyfall! Some of the more “mundane” cars are here too like the yellow Citroen 2CV from For Your Eyes Only and the Renault 11 minus roof from A View To A Kill! You can get up and close to the cars and have a look in but obviously no touching. The cars are not replicas, they are all originals or scale models that were used for filming. That’s particularly obvious in the cars that got badly damaged in stunts to create the high octane Bond scenes. 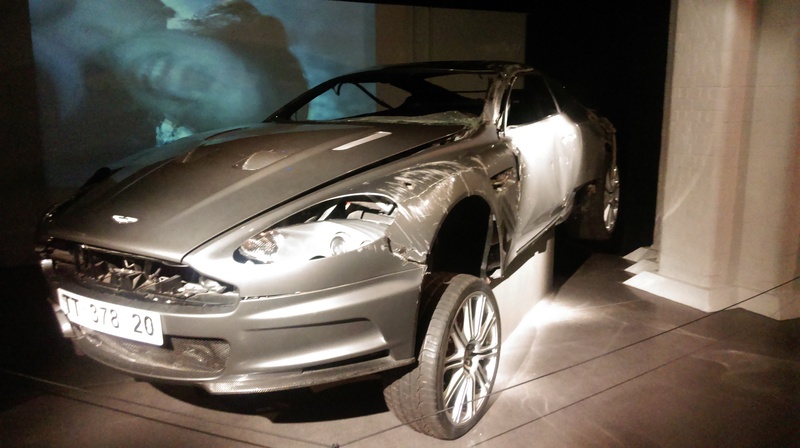 One of my favourite exhibits was the one of the destroyed Aston Martin DBS from Quantum of Solace and right beside it, the wrecked Aston Martin DBS from Casino Royale. It’s amazing what the cars and stunt drivers go through to make these dramatic, heart-pounding scenes and seeing the cars up close makes it ever more real. 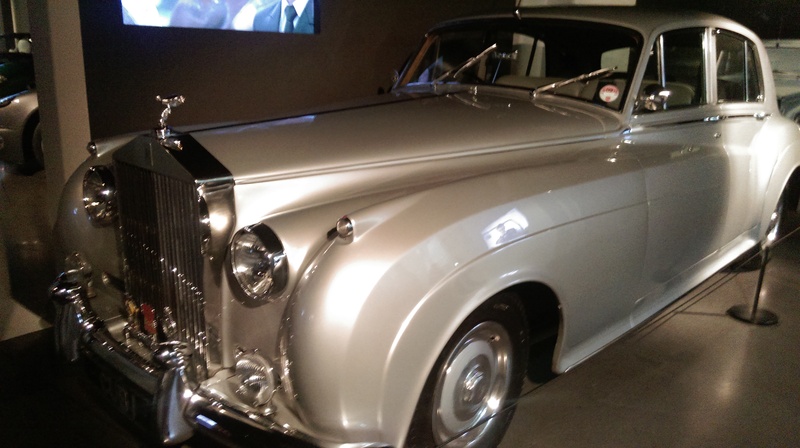 Bond in Motion is running at the London Film Museum indefinitely and new exhibits are expected to be added in 2015, including vehicles from the new Bond film, SPECTRE.